You may recall this stadium from our Designs section, but only today we've added it as an ongoing construction. Thanks to great help by local company Vasidrón légifotó-videó, who regularly fly over the project to depict progress. And there's been quite some progress! This time last year there was only a partial outline of the stadium in foundation stage while now the building is nearly finished. It was even hoped that it could be ready by July but it's most likely to open soon into the 2017/18 season, in early autumn. 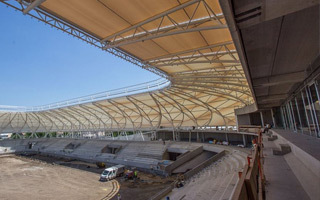 At present the roof awaits the last pieces of white membrane and the floodlight and sound systems, all expected to top the building at some 20 meters above the field. While we mention it, the field is also being prepared every day, while the precast stands are ready to be equipped with seating. As for the number of seats, it's expected to be around 8,600, roughly 1,000 less than initially planned in 2014. Still, that's enough to hold international games with UEFA Category 4 and expect some games to be sold out domestically. Attached to the stadium from the west are a new indoor hall with 458 seats and a large platform with two levels of parking. All of the above is expected to cost HUF 15 billion (€49 million), which is significantly more than Hungary got used to (and more than the early estimate of 9.6 billion) but still rational.